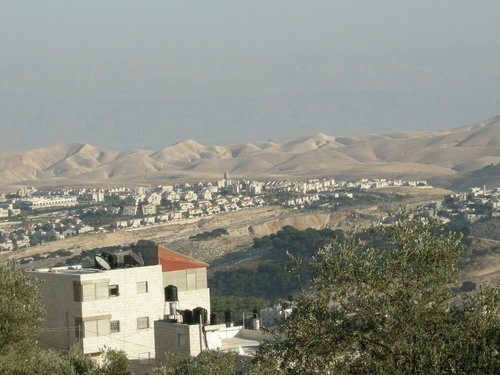 A view of Ma’ale Adumim. Photo: Yoav Dothan via Wikimedia Commons. “The whole world is watching” is a phrase that has been chanted by protesters since at least the 1968 Democratic National Convention in Chicago. The world has focused more critically recently on Israel’s settlements in occupied territory, after last month’s United Nations declaration — which the United States tacitly supported — that they are killing the dream of one state for Jews, one for Palestinians. This is a problematic statement for several reasons, and maybe even for some other reasons that I haven’t yet thought of. First, it’s circular reasoning. The Times claims that “the world has focused” on the issue. Yet Times editors, with their decisions on story assignment and placement, themselves exert substantial control over what issues the “world” focuses on. With the Ma’ale Adumim dispatch the second front-page New York Times article on the settlement topic in less than a week, the Times’ asserting of “focus” is, at least in part, a self-fulfilling prophecy. Second, it isn’t accurate. The “world” doesn’t “focus” on anything; it’s an inanimate object. But even if one reads the language metaphorically, as it is apparently intended, it doesn’t ring true. The Times offers no evidence for its claim about the world’s supposed “focus” on Israeli settlements. Much of the world doesn’t much care about the issue. And even those parts of the world that do care about the issue have been preoccupied in recent weeks with other major news developments — say, the inauguration of a new president of the United States, who is apparently determined to change American tax, trade, immigration, regulation and environmental policy. Given the scale of the turmoil in Washington, Israel’s settlement-building hardly registers — except with New York Times editors, who concoct this “world has focused” language as a way of justifying the placement of this snoozer of a story on the front page, even on a heavy news day. The United Nations Security Council resolution described by the Times as the beginning of a period of more critical world focus on Israeli settlements is more reasonably interpreted as the last gasp of the Obama administration on its way out. The Times says “the United States tacitly supported” the resolution, but in fact then-President-elect Trump expressed disapproval, and the Obama administration’s UN ambassador abstained. When Israel accused the Obama administration of orchestrating the resolution behind the scenes, the Obama administration vociferously denied the accusation. The Times didn’t call the Obama administration liars for that, the way the newspaper does when the Trump administration makes a factually unverified claim. It’s a measure of the Times’ monomaniacal obsession with the Israeli settlement issue that the newspaper has found room for not just one but two long front-page articles on the topic in the middle of one of the busiest news weeks in recent memory. The newspaper’s journalists may want to watch out, though; if they aren’t more careful, the world may begin to focus more critically on the ridiculousness of the newspaper’s coverage of the issue.